20-year-old Cindy Skrine (left) donated her kidney to a recipient in California so her mom, also named Cindy Skrine (right), could receive a new kidney through Emory's Paired Donor Kidney Exchange Program. Cindy Skrine suffered from high blood pressure for years. Then after the birth of her fifth child, her kidney function began to decline. The Acworth mom was diagnosed with focal segmental glomerulosclerosis (FSGS), a disease that affects the kidney’s filtering system (glomeruli), which causes scarring of the kidneys. Skrine began dialysis to help her kidneys function better, but was soon told she would need a kidney transplant. Family and friends began the testing process to see if anyone was a match to donate a kidney to Skrine, now 49-years-old, but no one fit the bill. Then Skrine and her family heard about the Paired Donor Kidney Exchange Program at Emory Healthcare. The program allows people to donate a kidney to a friend or loved one, despite incompatible blood matches. In paired donation, a donor and recipient are matched with another incompatible donor and recipient pair, and the kidneys are exchanged between the pairs. The National Kidney Registry assists multiple centers in coordinating these exchanges, often called "chains." Skrine’s 20-year-old daughter, also named Cindy, was able to donate her kidney though the exchange program, so her mom could receive a matching kidney from someone else. 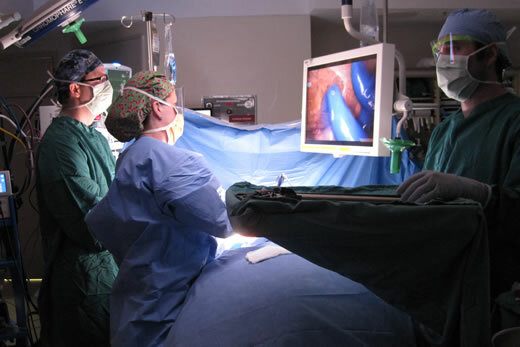 "The Paired Donor Kidney Exchange Program has given many more people the opportunity to receive a living donor kidney who otherwise would not have," says Nicole Turgeon, MD, associate professor of surgery, Emory University School of Medicine and surgical director of the Paired Donor Exchange Program. "In the case of the Skrines, Cindy, the daughter, started off the 6-way chain by donating her kidney to a person in California. The kidney from California went to a recipient in Tennessee, and the donor kidney in Tennessee went to Skrine -- the mom, in Atlanta. So three donors were able to give three kidneys to three recipients all across the country in one day," explains Turgeon. Skrine's kidney at Emory University Hospital on March 5. The Skrines’ surgeries took place on March 5 at Emory University Hospital, as did the other surgeries in the chain. By that evening, the elder Skrine’s kidney was functioning well. "It is a miracle and true blessing I was able to receive this new kidney through the Paired Donor Exchange Program," says Skrine, the recipient. "I have prayed for this for a long time and God has blessed my family and me with this special gift." The younger Skrine is also doing well after surgery. "I am happy I could help the process by donating a kidney so my mom could have the opportunity to receive a kidney. It has been a long road to travel, but it is all worth it," says the 20-year-old. Emory began its Paired Donor Kidney Exchange Program in 2010, has been participating in the National Kidney Registry since 2012. Since that time, the Emory Transplant Center has been involved in 24 paired donor kidney exchanges. However, in the last 12 months, from March 2013-2014, Emory has been involved in 18 different chains. "We are pleased with the successes we have accomplished with our relatively new program," says Turgeon. "Paired Donor Exchange is an efficient way to maximize the gifts of our living donors, allowing more patients to receive living donor transplants."